Lion Ark is an uplifting story of bravery and compassion when a poor but proud country said 'no' to cruelty and how attitudes towards animals were changed across an entire continent. As the lions begin to recover and thrive in the hands of humanitarian care, the documentary helps imagine and define palpable new definitions of justice and pride. Lion Ark has won the Audience Choice Award at the San Diego Film Festival, Audience Choice Award at the Anchorage International Film Festival, Best Documentary from the Sun & Sand Mississippi Film and Music Festival, Best Environmental Film at the Sedona Film Festival, Best Documentary Award at the Omaha Film Festival, Audience Choice Award for Best Documentary Feature at the Palm Beach International Film Festival, and was nominated for Outstanding International Motion Picture at the 45th NAACP Image Awards. Lion Ark comes to Indiana for a screening at the 1st Annual Alhambra Theater Film Festival in Evansville, Indiana on April 10th and 11th. Lion Ark co-writer/director Tim Phillips chatted with The Independent Critic all the way from Peru, where Animal Defenders International (ADI) is on yet another mission to save at risk animals! So, you're really in Peru right now? As you know, I saw Lion Ark several months ago and rather early in its festival run. I think one of the things that really surprised me as I started getting ready for our conversation is just how big Animal Defenders International really is. It's a relatively young organization, but it has truly grown into a global effort. We're actually a rather small organization. There's about 13 of us worldwide, but we are working in a phenomenal number of countries. We really have had such a successful run for the last some years. Our campaigns have really touched people and that has led to legislation is so many countries. Our work and activities have grown exponentially really. Can you kind of tell me how it all started? You've been with it since the beginning? Yes. Jan (Creamer, Phillips's wife and the organization's president) and I founded the organization in 1991. We were originally working in the U.K and a few years later we expanded internationally. That was really activated because of an animal trafficking ring. It was an animal trafficking ring masquerading as a circus. We were able to seize the entire circus of three tigers, six lions, and an African Python. Five dogs and three horses were also seized on welfare grounds. That was in 1996. We were told that we should get out of the city before daybreak or we wouldn't be getting out. Our work is very different than many animal rights organizations. If there is an animal trafficking operation, we will go in and actually get the animals as we did in Bolivia and we're doing in Peru now and we're just beginning to do in Colombia. 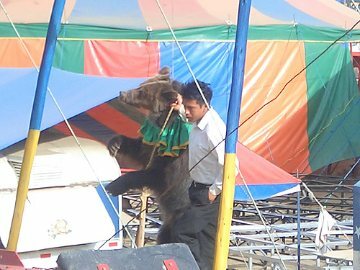 After we're through here in Peru, that's it for wild animals in circuses. They will have been completely removed from circuses. Our work is about rescuing the animals in the present, but also saving future generations of animals. It really is amazing all that you do. You really do approach it all from a legal standpoint of getting legislation passed that supports your mission and protects these animals. It's kind of like we saw in Lion Ark, which really begins after the legislation in Bolivia has been passed and yet is being ignored by some of the circuses. Yes, exactly. We really appreciated you very much, because you were one of the first people to review Lion Ark. It really was for some people the first time that they really saw what animals have to endure. I think we're unique because we'll take an issue from very early on. We'll actually do the investigation. We'll go undercover and shoot the photographs and take video and find out the truth about what is going on. We'll put that in the public domain and seek public support. Once we get that, we'll move on forward as we did in Bolivia. We're there not just to secure the legislation, but to try to enforce it. It is kind of unusual for an organization to keep going through every piece of the puzzle. I think some people who are seeing Lion Ark are just surprised by how on the ground it all is. That's kind of our modus operandi really. One of the things I've observed about ADI is that you're a rather low-key organization. I mean, I know that you've got the film and you certainly do get lots of publicity, but sometimes when you watch activist organizations it seems like they're as much about the attention as they are the cause. I don't get that feeling with ADI. It seems like it's truly about the animals. I know that both you and Jan were involved in the anti-vivisection movement even before you started ADI together. I think it's one of the reasons I really loved Lion Ark. All of this doesn't feel narcissistic. It feels very genuine. That's very kind of you to say. I think Jan is a huge part of that. You don't really get far with these kinds of things without getting the public behind the issue. This has always been our life and we have the philosophy that other people will respond to that whether it's in South America, the United States, or Europe. If you give people the facts and they know that they're reliable and substantiated they respond to that. That was one of the things with Lion Ark - to create a film that people could watch on two levels. They could really enjoy it and really get to know the animals, and they could get an understanding of what these animals go through without it being a heavy, heavy documentary. Ultimately, it's got a very happy ending. The other thing is that we didn't really want to show their suffering. We don't really dwell on it. It's the unfolding of "This animal's in a tiny cage." People can see the difference when we go in and the animal will start to engage and play. It's interesting showing the positives. You realize by the end of Lion Ark just how terrible these animals' lives were. It's very, very important to find a way to reach people and communicate with them the facts. 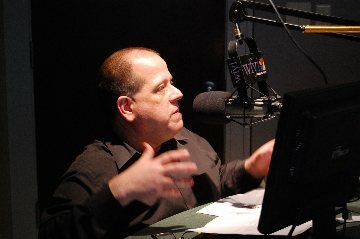 As an organization, and I think it's important to mention since we are talking about film and The Independent Critic is a film website, that you've also been involved with the film industry in terms of accountability and in terms of really questioning the American Humane Association. Yes, yes we are. I think ADI has done the the biggest expose' of people who've mistreated animals. I think that's a whole other area much like circuses where people have begun to realize just how much animals go through for our entertainment. We've got 31 countries now that have introduced national legislation that either bans the use of all animals or wild animals or certain species. There's a huge change globally in how we think it's acceptable to use animals. Now then, what happens to animals in films is often very similar. For example, when we exposed the biggest supplier of elephants that you've seen in films like Water for Elephants and Operation Dumbo Drop and The Zookeeper and people were absolutely shocked that when you see the animals in the background responding on command that these animals have been beaten and electric shocked and all manner of things. I think it's part of the same process. What's exciting is that more companies are some big, big commercial companies are talking to ADI and saying "Okay, we won't use animals anymore." We're also talking with filmmakers and film producers. We're hearing more and more positives from the film industry itself. I thought it was fantastic when the director of Dawn of the Planet of the Apes came out and they said "This film is about exploitation. Why would I exploit animals to make this film?" I think we're seeing a big shift in how people think animals should be treated. I think there's a clear "line in the sand," if you will asking "How should we treat animals to amuse ourselves?" I think that's why you're seeing such progress in the world of Animal Defenders International. Okay, so I want to ask something and it may very well come off as stupid. I'm going to ask it anyway, because I want to be sure I'm representing your position accurately. Let's look at the film industry as an example. Obviously, animals are still used in the film industry despite the growth of CGI. Is there a way to use animals in the film industry appropriately? There might be limited cases, but it would have to be in cases where the animals could simply be animals. We know now that when animals are trained for performance, it's simply not happening without them being beaten or abused. There's simply overwhelming evidence. We know this for a fact. You can't call it humane just because the animal wasn't hit on set. Something happened to make that animal behave that way. The monitoring system would have to change dramatically. The film industry needs to ask "Are we filming animals just to film animals or are we filming animals for a sideshow?" I think there should be very serious questions asked. We say at the end of Lion Ark "Animals were saved from harm during the making of this film." So, there are ways that you can film animals in documentaries and so forth where you're giving an accurate representation and you're not forcing them to do anything. It's a difficult issue. It would be a good start if the film industry would simply say that they wouldn't use animals unless they were absolutely necessary. So, if someone sees that "No animals were harmed in the making of this film" claim, they should question it? Yeah, without a doubt, especially if you see it from the American Humane Association. We came out against them after we'd done an undercover investigation of an elephant supplier. Those elephants were electric shocked, beaten, and they were chained up. They were living a pretty deplorable life which any reasonable moviegoer would think was wrong. Because the animals weren't harmed on set, they weren't beyond saying "Well, the animals weren't harmed on set. We didn't see their training." Statements were in that film that these animals had never been beaten, never been abused. We showed that was categorically untrue when you saw the video. I think there has to be an exception when what you see on set with performing animals when it doesn't tell the whole story. When you say "No animal was harmed in the making of this film," you are sidestepping what is the biggest issue which is how the animals were trained, especially big, dangerous animals. The evidence now across America, Europe, South America, and other training centers is absolutely consistent. Violence, subjugation, and coercion are used in the training of the big species. So, if you see an elephant stand on its hind leg or do something like that then something has happened that has radically altered that animal's behavior and the alarm should ring instantly. I think a policy of no exotic animals in films is the first step, then controls over how domestic animals are used in films. I want to make sure we spend some time talking about Lion Ark. I was really hoping it would get into an Indianapolis Festival, but I'm at least pleased that Indiana audiences will get to see it. Can you talk about how ADI got to the point of saying"Let's make all of this into a film?" I've not sent you the final cut of the film. You sit through a festival tour and something like a hundred screenings and you learn things. We got a distribution deal with ITV and we re-cut it a little bit. I'm really, really pleased with it. I must send you a copy to see if you can see where we've refined it and improved it a little bit. How it came about was that we were heading to Bolivia and it was the first time an enforcement operation was going nationwide. We didn't know how it would unfold. We could have gotten there and ended up in court for the next four years. Jan and I got two cameramen and said "This is about to happen and it could be incredible and it could be a chance to show these animals in a way that has never been done before." It just unfolded, like a drama really. Even the order of the seizures began quite quietly. Then, there'd be one that would be really, really difficult. Then, on the next they'd hide an animal and we'd have to search and we'd have to monitor them to get them to hand over the animals because they were under constant surveillance. It was remarkable how it fell in just a storytelling way. It just goes to show how real life really is pretty entertaining! We had taken a gamble really, and we were filming on RED Epic. That really surprised many people. That was one of the decisions that I think really paid off for us. We filmed and filmed everything. We filmed approaching 100 hours of our operation which, for a low-budget documentary, is a staggering amount. We initially thought we could hand this over to somebody, and we spoke to people and they'd come back with different ideas. We'd think to ourselves "We really know where we want this story to go." One producer said "How I want it to end is I want to be really shocking and at the end we show something really horrific." I said "You don't know what we've got here. We've got a happy ending to a serious documentary." That's just never happened. You look at Blackfish and The Cove. This is an amazing story. It doesn't pull its punches, but it's got a happy ending. People can leave the cinema with a smile on their faces rather than wanting to go home and put their head in the oven. So, Jan and I were really starting to feel like we wanted to express ourselves and a few people were really encouraging us - Jorja Fox from CSI and other filmmakers were saying "You've both got a vision for this film how it's about the animals' story and you will make it about the animals." So, we started filming it and we really loaded the budget at the filmmaking stage because I feel that's the most important place. If you don't get the production, then you won't be able to make a great film. Then, three of us really started working away on it - transcribing the footage and other things for over a year. Finally, we took it to a great color correction facility in Santa Monica, Prehistoric Digital. We deliberately mixed the sound with someone who works in traditional dramas and films rather than documentaries, Javier Benassar, who has worked on Still Alice, Austin Powers, The Last of Robin Hood and others. I think that really paid off for us, because we kept it, as you know, all live action. That was a huge challenge. I see lots of trailers for documentaries and I watch them thinking they're going to be live action and that ends up being only a small component of them. I thought "We can make this film all the way through as it unfolds." Jan talks very passionately about animals and very accurately When she's doing that and she's standing there, she's tired, and it has been 24 hours after we've rescued animals and there's a lioness right there that's going to have a really different impact than just sitting in the ADI studio or somewhere else just talking about it. So, it was edited and it was re-mixed and out came Lion Ark. It's had a pretty terrific response. It's won its awards now. I think every second or third film festival it's won an award. We got an NAACP Image Award nomination. We were really pleased about that because it was the first time that an animal rights film had been nominated in the "Outstanding International Motion Picture" category. We'd always wanted to make a film about the different people who came together - the Bolivians, the Colombians, the British, and the Americans and so forth. It's not like "Here come the Westerners to save the day." We were really so proud when we went to the NAACP Image Awards. We didn't win, but to make it to the last five and be the first animal film to make it was terrific.